Do you keep a diary or a journal? Do you remember any entries that stand out? 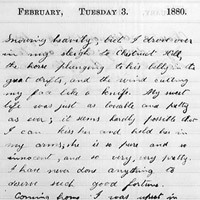 On February 3, 1880, Theodore Roosevelt wrote in his diary: "... I drove over in my sleigh to Chestnut Hill, the horse plunging to his belly in the great drifts, and the wind cutting my face like a knife. My sweet life was just as lovable and pretty as ever; it seems hardly possible that I can kiss her and hold her in my arms. " Who was Roosevelt's "sweet life?"